HomeParadise BlogParadise in the communityParadise Dental Mission Mixer: Join Us May 2nd! 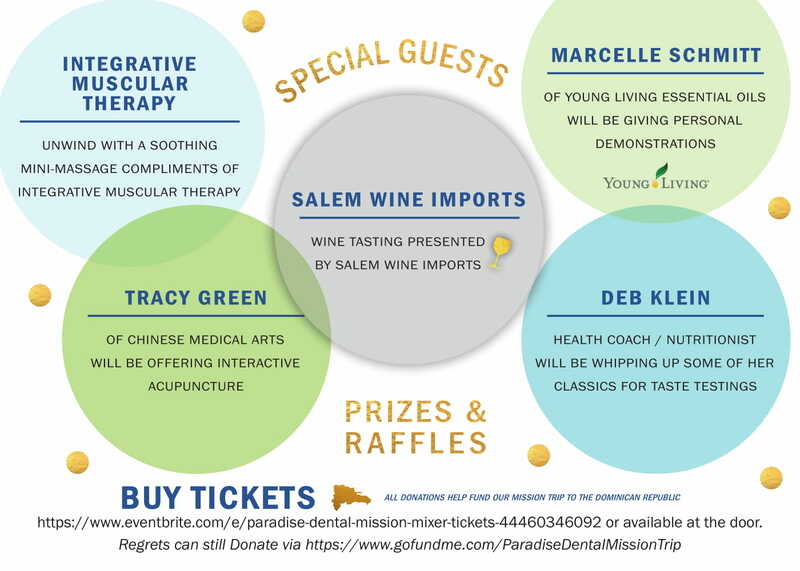 Paradise Dental Mission Mixer: Join Us May 2nd! You’re invited to our Mission Mixer on May 2nd, 2018. By working in coordination with World Mission Partners, we are advancing towards the goal of our mission trip, which is set for November 2018. To accomplish this goal, we need the support of our community. Due to unfortunate sanitary conditions, lack of healthcare, dental care, and food supplies, the people of La Romana, Dominican Republic need our help currently. Some of the costs that go along with this mission trip include dental supplies and travel costs. Be sure to stop by for a fun-filled night out or pop in quickly for a drink and massage. Get your tickets today via our Eventbrite page, or feel free to contact us about the event. Not available May 2nd but still want to learn more and help our 2018 Mission Trip to La Romana? Head over to our GoFundMe page! Deb Klein, Health & Nutrition Coach: Deb Klein is a health coach & nutritionist, who provides a holistic view towards health and wellness! She will be whipping up some of her classics for taste testing. Marcelle Schmitt, Young Living Essential Oils: Marcelle Schmitt will be giving personal demonstrations of her incredible essential oils. The vision of Young Living is the bring the truly life-changing benefits of essential oils to every individual. Salem Wine Imports: Salem Wine Imports is in the historic, downtown Salem, MA, and prides itself on the exploration and thrill of trying new wines. Tracey Green, of Chinese Medical Arts: Acupuncture is a method of encouraging the body to promote natural healing and improve functioning. This is done by inserting sterile stainless-steel needles and applying heat or electrical stimulation at very precise acupuncture points. Integrative Muscular Therapy: Integrative Muscular Therapy Center in Marblehead, MA can provide services that help to maintain your overall health and wellness, including back massages and more. We hope you make it!